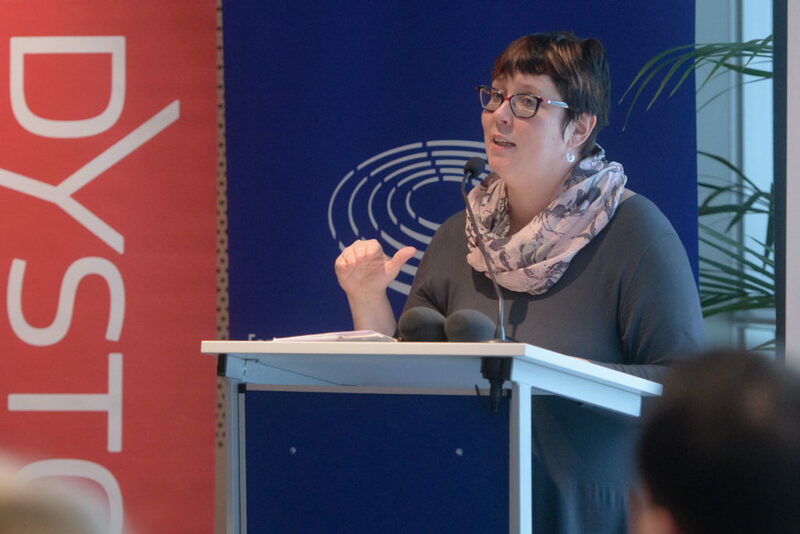 For our 25th Anniversary event we were welcomed into the European Parliament, Brussels by Finnish Member of the European Parliament (MEP) Merja Kyllönen. She explained how she had become involved with Dystonia Europe when she agreed to do a Jump for Dystonia, she just hadn’t realised it would be out of an aircraft! She described it as the most fun you can have with your clothes on! She also said it helped her to understand how we are all prisoners of our bodies and dystonia patients more than most. Donna Walsh, from the European Federation of Neurological Associations,then thanked MEP Kyllönen for the warm welcome. Donna explained EFNA is an umbrella of pan-European patient groups including Dystonia Europe, working at EU level to include a socio-economic angle in their policy messages to match the priorities of the European Union in terms of economic growth and social progress. ‘The economics are something that we have been working on for a long time in the area of neurology. The European Brain Council conducted a Cost of Brain Disorders Study in 2006, repeated in 2010 – showing the cost of brain disorders to the European economy is 800 billion euro per year. More costly than cancer, cardiovascular disease and diabetes combined. A figure that is growing. A figure that includes 40% indirect costs – e.g. not being able to work, the need for informal care, etc. And this makes it a scary figure, because how do we tackle such a large and complex challenge? ‘So last year the EBC and its partners tried to simplify the challenge by proposing real solutions. Doing exactly what you mentioned MEP Kyllönen, instead of looking at cost, we looked at value – the value of treatment. We mapped the patient journey and costed the desired/best practice approach to care versus current care, or no care – illustrating the cost savings that can be made if things are done right. She then presented the first results of the survey to assess challenges patients face in accessing correct diagnosis and treatments and measuring satisfaction with the treatments. She said most people who responded to the survey were in their most productive years 21-60 years old. In answer to the question What was your experience when you first visited your General Practitioner (GP) with symptoms?23% said the GP did not recognise my symptoms and did not refer me to a specialist and 21% said the GP misunderstood my symptoms and referred me to an incorrect specialist. Correct diagnosis for 12% of people took over 10 years. Most people received extra information about dystonia via a dystonia patient organisation. • Diagnosis is not easy, treatments are limited, and not always effective so many patients suffer from a remaining disability. • Expert long-term care is rare yet with correct diagnosis, treatment and care a near-normal life can be achieved. • and more research is needed. This year’s patient led campaign on access to healthcare will be based on the previous work EPF has done. It will support the 2030 Agenda focusing on the SDG 3 on health, build on the outcomes of 2017 campaign and will link to other EPF work, e.g. on non-discrimination, quality of care and access to medicines. ‘In our future multi annual programme, EPF have committed to delivering information tools of the UN SDG on health and we will organise a UHC Conference in 2020’ Bedlington said. Nessa Childers MEP, from Ireland who is Chair of the Access to Medicines interest group then spoke. She said that for rarer diseases, such as dystonia, research collaboration across the EU was a way forward. She said Brexit put both collaborative research and treatment at risk. She said in the event of a hard border Irish patients would no longer be able to access deep brain stimulation in UK facilities. Adina Vălean MEP from Romania, sits on the European Parliament Environment and Health Committee. She spoke of the importance of keeping funding for the EU Health Programme. She said it is a vital enabler for health policy formulation and for effective implementation. She also said that the challenges for neurology research can be solved by collaboration at EU level. MEP Marian Harkin from Ireland who is a member of the Committee on Employment and Social Affairs agreed saying there is a real threat to the EU Health Programme as health is not a priority for the Commission. Although it is definitely a priority for European citizens and this should be noted by the EU President. Dr Jean-Pierre Lin, consultant paediatric neurologist in the general neurology and complex motor disorders service at Evelina London Children’s Hospital then spoke. He said dystonia in childhood is often severely disabling, unremitting and unrecognised. Its link with cerebral palsy (CP) is misrepresented and this means dystonia is not such a rare disorder. Commenting on Prof. Goodchild’s presentation he said if dystonia was locked out of general calls for research funding childhood dystonia was doubly so. Prof. Marjan Jahanshahi, said that in her 35 years as a professional little had changed for the patient experience. Dystonia is often still misdiagnosed or takes too long to diagnose. We have had botulinum toxin now for 35 years and DBS for 25 years, but new treatments are still needed. Her question to Nicola Bedlington was we have seen some improvements in medicine but how can we improve the patient journey?